I didn't want a real "themy" nursery and wanted something that would be able to grow with our first baby. I loved the idea of super bright, almost rainbow colors with a neutral base to complement them. The wealth of resources on Pinterest made it fun to put the room together, and we actually ended up spending half of what we budgeted for. Several different inspirations from Pinterest and Project Nursery, with the main inspiration being the white Jenny Lind crib, simple white dresser that could be used as a changing table, and bright colors. Once we found the fabric for the changing pad cover and crib skirt, it all seemed to come together. Modern, clean, organized, and functional with great colors for visual stimulation! The items I made- the crib skirt, crib mobile, drawer liners, changing pad cover and the giant giraffe that was a gift from a family friend! We're thinking of using him with the baby's monthly photos. Collect all your ideas in one place, such as Pinterest, so that it's easy to get an idea of the real look or theme you're going for. Don't get discouraged if it doesn't turn out the exact way you planned. Sometimes organized chaos can create a really unique look. I love the organization! Brilliant. And the drawer liners are so neat. Bravo. Modern simplicity at its best. And you did great with that DIY abstract art! Hi! Everything looks great! Can you tell me where you found the drawer inserts for the changing table (little cloth dividers)? Thanks! Oscar due Feb 11th, 2013. 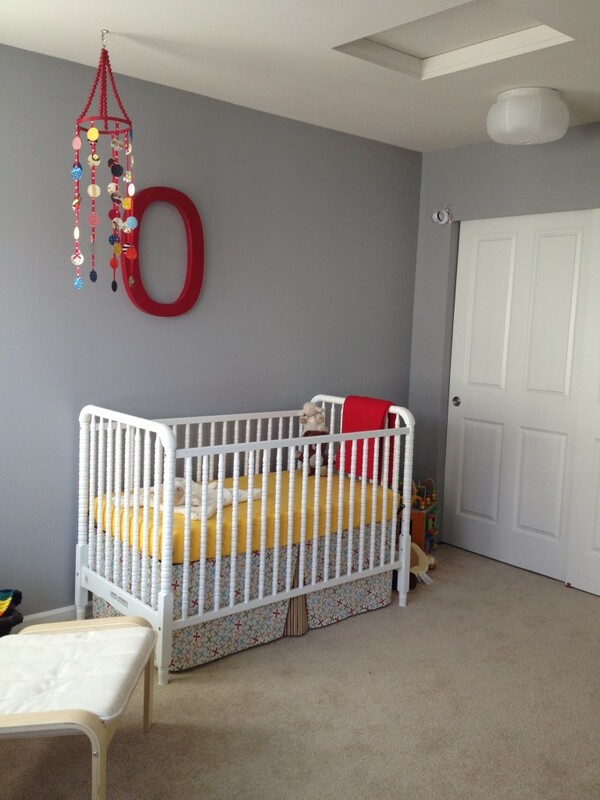 Been working on the nursery with lots of help from Pinterest and Project Nursery! Love finding inspiration from all the super talented people out there.